In almost every successful organization you will find that one of the greatest assets it has is its people – their attitude, their expertise and ultimately, the results they produce. The employees at Winzeler Stamping Company take great pride in the quality of the work they produce and in the attention to detail that is given to each production part from design through delivery. 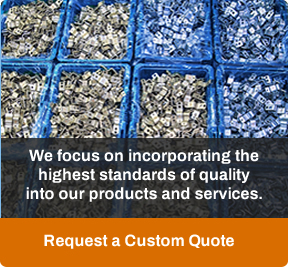 We have helped provide solutions to many unique challenges presented to us by our customers over the years. The guiding principles that drive us to achieve complete customer satisfaction along with the experience, knowledge, and capability we possess, have allowed us to fulfill the diversified needs of the many industries we serve. Below you will find quick summaries for just a few of the successes we have experienced. 7:00 a.m. on Saturday, parts emergency! A leader in the hydraulic components industry was challenged by their customer to reduce the cost of a family of parts by as much as 20%. Several stamping companies were invited to participate in this cost cutting opportunity; however, Winzeler Stamping had an engineering solution…Read more…. A Tier One automotive manufacturer contacted Winzeler Stamping Company after they were notified of the immediate closure of their metal stamping supplier with whom they had 16 production parts sourced. We reviewed their drawings, inspected the tooling, and pledged to help them meet their deadline by producing the parts that would allow them to supply their OEM customer without interruption. Within three weeks, Winzeler Stamping Company had quoted retooling costs, received and adapted their tooling, sourced material, secured PPAP approval, and received final sign off from the customer. We were able to surge to meet their requirements and delivered on our promise. We provided the parts on time and our customer was able to fulfill the needs of his customer as well. Winzeler Stamping Company’s Engineering and Tool Room capabilities helped one customer improve the quality of their part as well as reduce costs. The part had been manufactured for years by two stamping companies with vast experience in the stamping of steering linkage components from a progressive die with secondary operations. With the combined efforts of our engineers, tool builders, and production associates, we were able to produce a higher quality steering linkage sleeve component than had been previously delivered to the customer by their former supplier. In addition, we designed a progressive tool that would include the secondary operations, thus reducing its overall cost. As a result, the higher quality part resulted in lower costs for the OEM due to fewer quality issues. Ford Motor Company was extremely pleased with our work, so much so that they recommended Winzeler Stamping Company to another of their Tier One suppliers and asked that they consider purchasing their linkage sleeves and clamps from us due to our advanced capabilities, quality, and ability to reduce cost. A major diesel engine manufacturer had been experiencing field quality issues related to an injector sleeve. The costs related to their problem were in excess of a million dollars and they needed a solution fast. The Winzeler team worked under immense pressure to engineer and manufacture a solution. 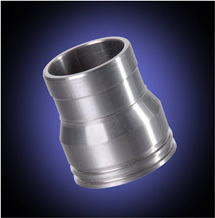 We stretched the boundaries of traditional engineering know-how to design and produce a stainless steel injector sleeve that not only met the tighter requirements of the prints, but we delivered the product on time. We delighted the customer with our solution and helped them stop the erosion of profit caused by the poor performance of the previous part. When one of our salesmen received a call on his cell phone at 7:00 a.m. on a Saturday morning, he heard the voice of a customer on the other end of the phone in desperate need of a particular component that would allow him to continue his production and meet his customer’s deadline. Soon after the call ended, our salesmen met the customer at our facility and arranged to have 5,000 pieces loaded for him to take with him that morning. Even though we were closed, we realized that it was critical to our customer. At Winzeler Stamping we believe that we should not only meet the needs, but exceed the expectations of our customers whenever we possibly can. A leader in the hydraulic components industry was challenged by their customer to reduce the cost of a family of parts by as much as 20%. Several stamping companies were invited to participate in this cost cutting opportunity; however, Winzeler Stamping had an engineering solution for this program. In order to meet the challenge, we needed to acquire a larger transfer press that had the real estate and the tonnage to accommodate the four different part sizes. The old design was slow and costly so we developed a method by which we would stamp the shells and put the groves in by displacing material while in the press. According to the customer, Winzeler Stamping Company positioned them to achieve significant savings and increase market share. We were awarded the business with an estimated annual usage of 8.5 million pieces. We demonstrated superior engineering knowledge and possessed the financial strength to acquire needed machinery, allowing us to achieve a better part with a better design for our customer. Winzeler Stamping Company was approached with an opportunity to quote eight different part numbers, four aluminum shells and four steel inserts, for an automotive climate control tier one supplier. In order to achieve the dimensional tolerances and the throughput required to be competitive, we determined that we needed to acquire a new Platarg Press. Winzeler Stamping Company submitted a successful quote package and was awarded the business based on three million pieces per year. Over the course of the next year we added additional part numbers and the volume increased to over 24.5 million pieces. In order to meet increased demand, we purchased another new press. Once we acquired the new press we optimized production by running the aluminum parts on one press and the steel parts on another.